If the price is trending, the gap fails to change the trend. If the price isn’t trending, the gap fails to initiate a trend. Common gaps are generally insignificant. A common gap tends to have low volume on the gap day. To judge an opening gap, consult volume. If volume is low or normal, traders aren’t jumping on the bandwagon, and it’s probably a common gap. If volume is abnormally high, traders are jumping on the bandwagon, and the gap will probably lead to a big rise or fall in the coming days. A security that normally has low volume tends to have more gaps than heavily traded securities. A low-volume security is described as thinly traded, meaning few market participants. Don’t try to interpret gaps in thinly traded securities. These gaps are usually just common gaps and mean nothing at all. You can identify a gap at the open of the bar, but you can’t measure a gap until the day’s trading is over. Then you measure it from yesterday’s high to today’s low (for an upside gap) or from yesterday’s low to today’s high (for a downside gap). The gap is between the bars, not between the opens and closes. 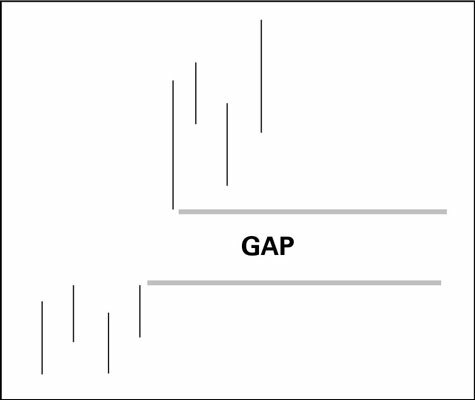 If the security opens on a gap but then the gap is filled during the day, the gap doesn’t show up on a daily chart. The same thing is true if a security gaps during the day on an hourly chart — the daily bar doesn’t show it.